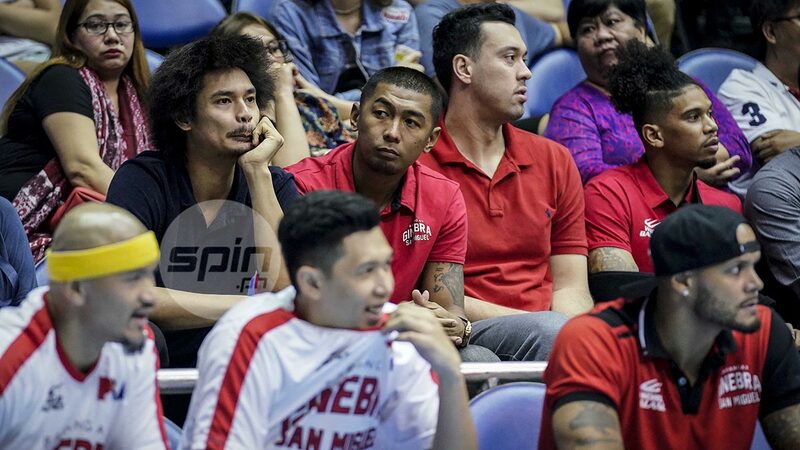 Japeth Aguilar joins Ginebra's injured list. JAPETH Aguilar sat out Barangay Ginebra's game against Blackwater on Friday night in the PBA Governors Cup due to a righ calf strain. Aguilar showed up in street clothes at the Smart Araneta Coliseum and joined a long list of injured players sitting on the Kings' bench. The 6-foot-9 Aguilar said he suffered the injury during Team Pilipinas' 91-82 win over Qatar in the FIBA World Cup qualifiers Monday. "Last two minutes nung game against Qatar," said Aguilar when asked how he incurred the injury. Aguilar sparked the national team's second half comeback agains the Qataris in the closed-door game as he finished with a game-high 16 points along with Alex Cabagnot. The absence of Aguilar left the Kings without their two Twin Towers against the Elite, with frontcourt partner Greg Slaughter still to fully recuperate from an ankle injury. Aguilar said he's also doubtful when the reigning champions face the San Miguel Beermen on Sunday. Others in the injury list of Ginebra are Sol Mercado, Jervy Cruz, Raymund Aguilar, Art dela Cruz, and rookie Julian Sargent.